I have decided that I have had enough of the chaos that clutter brings to my household. We have worked really hard to clean up our diet. We dumped processed food out of our lives and we feel so much better. Now, it’s time to purge the burden of clutter. We started the Declutter Challenge in the master bedroom. It started out great. I was tossing stuff into the trash and donating things. Then, I hit a roadblock. I decided to move to another room and that is when I completed my bathroom declutter. I am totally loving my bathroom right now! Then, I decided to move on to other areas of my home. Again………roadblocks. What the heck was going on? I realized that I was having an emotional reaction to the declutter process. Early in my adult life, I went through a period of time where I had very little money. We quite literally had a budget of $14 per week for groceries. There were only three of us at that time, but $14 is an extremely small budget. During this time, I started to hold on to material things. New purchases were hard to come by, so if I had anything nice, it was certainly treasured. I felt that I had so little. There was no way that I was going to throw anything away. Fast forward many years later and I realized that I was still carrying around this mentality. I was letting emotional barriers get in the way of my declutter process. And then it hit me! What if I quit thinking about getting rid of items as a bad thing? Would it be easier for me to work through this declutter process if I think of how items that I am no longer using could be a blessing to someone else? I was really struggling with clearing away the kids’ toys that they are no longer playing with. Instead of throwing the unused toys away, I decided to look for places that I could sell or donate them to that would really appreciate the items. I can’t tell you how good it feels to see children enjoying these items again. It kind of reminds of the movie Toy Story. I want to make sure that Buzz and Woody have children to play with. Instead of thinking about me losing something, I decided to think about how good it feels to bless other people. One man’s junk……….is another man’s treasure. My clutter isn’t doing me any good sitting on shelves not being used. It really does feel good to help out other people. I encourage you to rethink your clutter. Do you know anyone that could actually use the items that you are no longer using? Be a blessing to them. I know when I was eating $14 per week for groceries that I would have been over-the-moon excited if someone would have shared their kids extra clothes or toys with me. Anything that I did not have to go out and buy really was a help to me. Kitchen items, curtains, you name it……….I needed and appreciated it all. It really is just a matter of paying it forward. People are always looking for items they need or want in Facebook groups like Buy-Sell-Trade and garage sales. Be on the look out for organizations that will come to your house to collect your donations like Easter Seals and Purple Heart . Toys and clothing can be shared with younger children you know. Donate toys to local daycare centers. They are always looking to update their collection of toys. This is a great way to get rid of the big stuff like toy kitchens and riding toys. You can make money on your no longer loved clothing at consignment shops. Check with family and friends to see if they need any of your items. Youth groups and service organizations……Your local Boy Scout troop would probably love for you to share unused camping equipment, pots, and pans with them. College and community theaters love your old decor items to use as props in their plays. I know from personal experience that it is a hoot and a half to see your items on stage. These are a few ideas to get you started. Where else can you think of to donate your unused items so that you can be a blessing to others? Leave me a comment below so that we can share these ideas with everyone. 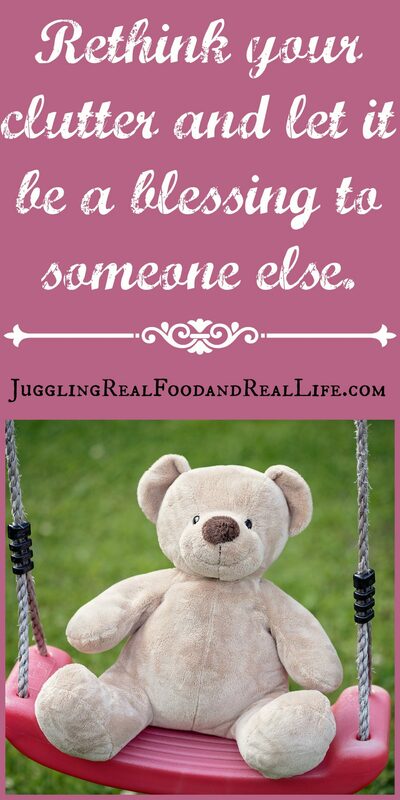 I think you hit the heart of decluttering Christina…being a blessing to others! Thanks for another great and encouraging post! Janelle@The Peaceful Haven recently posted…What Exactly Is A Healthy Diet?